Psysh Mountain is in the western Caucasus just north of the Georgia-Russia border. This is the western most significant glacier complex in the Caucasus, here we focus on a glacier flowing east from the mountain and another on the north side. The east flowing glacier drains into the Psysh Valley and then to Arkhyz, while the north flowing glacier drains into the Zagedan River. The Caucasus region has been experiencing widespread significant retreat (Shahgedanova et al 2009), with average retreat of 8 m per year due in large part to increased summer temperatures. The larger glaciers of Mount Elbrus tend to garner most of the attention, but the retreat is widespread. This region has been an area of increased proglacial lake formation as well Stokes et al (2007). Psysh Mountain is 115 km east of Sochi, Russia. The glaciers mean elevation is 3000 m, more than 1000 m above the higher elevations of the Sochi Olympic skiing venues. Here we examine the glacier retreat in Landsat imagery from 1998 to 2013. In 1998 the two glaciers of interest on the mountain ended in incipient proglacial lakes, less than 100 m across, yellow and red arrow. By 2013 the lake at the red arrow has expanded to a length of 400 m that the east flowing glacier ends in. The lake at the terminus of the north flowing glacier is now 350 m long. This indicates a retreat of 300 m for both glaciers. 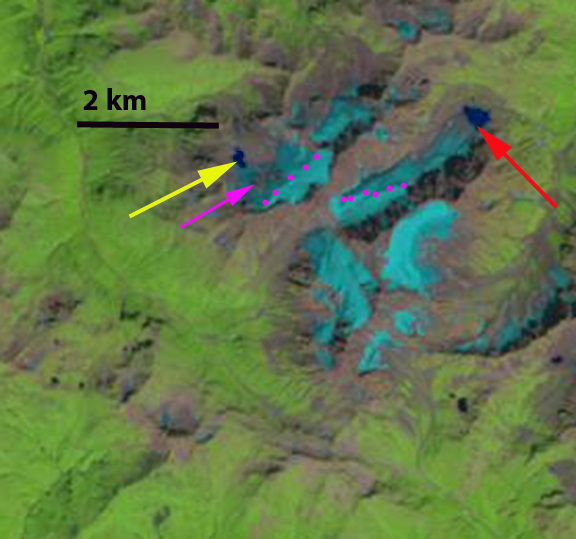 The pink arrow indicates the expansion of bedrock in the midst of the north flowing glacier. In the Google Earth image the most striking feature is how little of the glacier is above the snowline. In each image the snowline is indicated with pink dots. 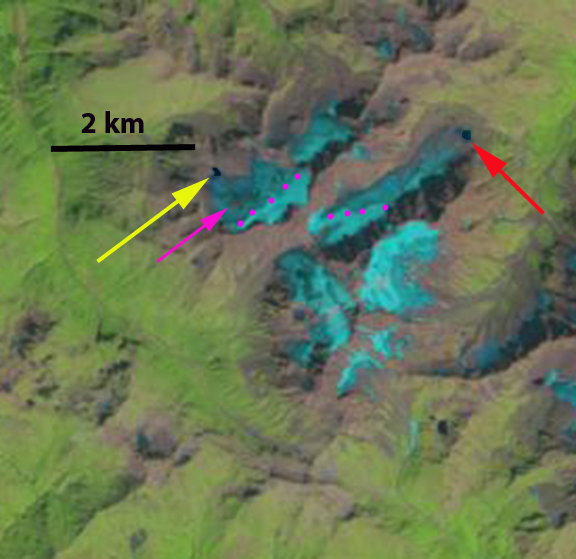 It is evident that neither glacier has a persistent significant accumulation area. These glaciers cannot survive without a persistent significant accumulation zone (Pelto, 2010). 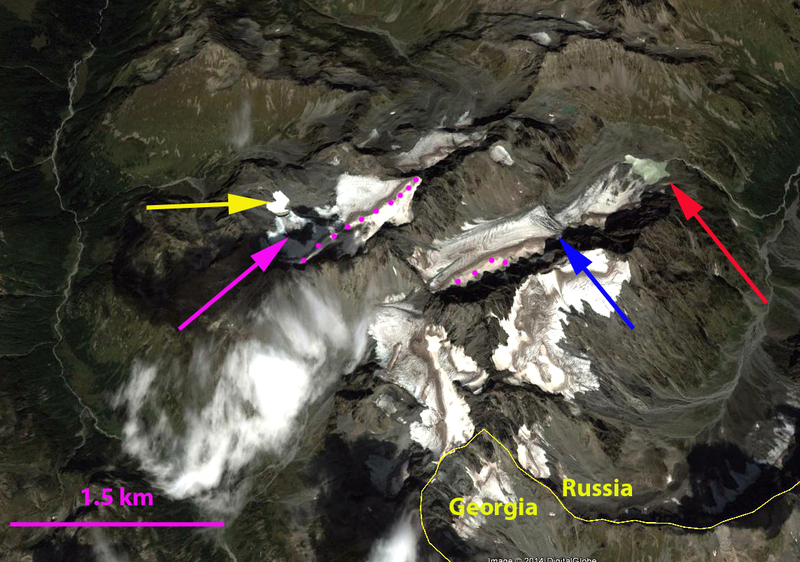 The blue arrow in the Google Earth image indicates an icefall in the east flowing glacier. Below the icefall the glacier has a low slope and is stagnant. This basin’s extent suggests the lake can expand another 1 km. The retreat of this glacier is similar to that of Gora Bashkara Glacier and Lednik Karugom. This entry was posted in Glacier Observations and tagged glacier global warming, glacier lakes russia, glacier retreat caucasus russia, Psysh Glacier retreat, western caucasus glacier melt, western caucasus glacier retreat. Bookmark the permalink.